Surprisingly they’re not fighting over who gets to kill Superman. We last left Superman in the Phantom Zone and Professor Hamilton on the run from Brainiac in the Fortress Of Solitude, with nukes about to launch all over the world. Lois and Jimmy manage to escape the explosion but the world is still in trouble. So they’re forced to turn to an unexpected savior…Livewire! Not wanting to see her home planet blown up she travels to the Fortress and brings Superman out of the Phantom Zone. 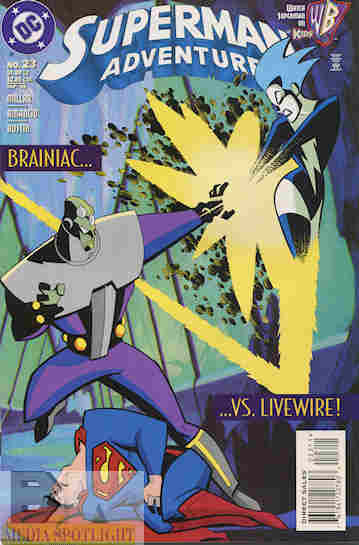 Together they attack Brainiac, and Superman sends him flying while Livewire sacrifices herself to stop the missiles, going comatose. Brainiac still tries to send a Russian ICBM at Metropolis so he can make his getaway but Superman sends the missile into Brainiac’s ship, destroying him. Secretly, Lex gets his hands on the remains and he has plans for the robot. What they got right: While DC in recent years has been a bit obsessed with their villains, leading to “Forever Evil” (an event where the villains have to save Earth from the Crime Syndicate of Earth-3) this is more interesting to me. Livewire is a shock jock created for the show who is more of a troublemaker than the criminals Superman usually has to put up with. So seeing her take on the role of hero, even if reluctantly and even if it means she has to rescue Superman, makes quite a bit of sense. There’s also a nod to the “Electric Superman” appearing the main titles at the time. What they got wrong: I really have no complaints on this one. The old steel desks taking the explosion works well enough for me given that they were just computers exploding, and the oddity of that working happened last issue. Recommendation: A good Superman two-parter that is also a change for Livewire. Worth picking up. Posted by ShadowWing Tronix on December 2, 2017 in Animation Spotlight, DC Spotlight, Television Spotlight, Yesterday's Comics and tagged Brainiac (comics), comic review, DC animated universe, DC Comics, DCAU, Kids WB, Livewire, Professor Emil Hamilton, Superman, Superman Adventures, Superman: The Animated Series.